Because partition remains so too do all the injustices associated with it. That’s how partition has been maintained. To remove the injustices you must also remove partition. To address any injustice we must address its root cause and in the case of the Housing Discrimination in North Belfast that means addressing it as a means to address the issue of partition itself. We are only fooling ourselves, or allowing others to misguide us, if we think that issues such as these can be resolved independent of resolving the politics which created them. Civil Rights was and is a political tool of the British and Unionist establishment to coerce and cajole in equal measure nationalist acceptance of the constitutional status quo. Within a system such as the Six Counties there are no civil rights; rather there is a system of dispensing social favours in return for acceptance of the legitimacy of the political power dispensing them. This abuse did not commence in 1969. Rights, be they social, civil, political or cultural, have been denied the Irish people since the occupation began. The political response to this has generally taken two forms, those who would campaign for repeal of such abuses in pursuance of national freedom and those who seek their reform in pursuance of a British/Irish constitutional arrangement on the island. In the 1840’s James Fintan Lalor expressed it very clearly when he said that the struggle between tenant and landlord is but a smaller version of the struggle between Ireland and the power that occupies her. To struggle for one you must struggle for both. It remains the same today. Equality in Housing Allocation will only come about for two reasons; either it is in the interests of the British/Unionist establishment to grant it, which means a political price to be paid from nationalist parties, or, we fight for them as a mechanism to undermine the very existence of the Six County state itself. We cannot go down the road as some have done with Policing. We cannot be fobbed off with cosmetic gestures, toothless talking shops whilst all the while the old practices continue hidden by a very thin veneer of so called reform. Neither can we allow ourselves be bought with the promise of funding for inadequate and outdated modes of housing. PR sound bytes on the Six O’Clock News from political representatives seeking kudos for securing inadequate funding for inadequate housing projects must not be considered progress. Social progress must mean social change. Political progress must mean political change and in the Six Counties that must mean constitutional change. In the meantime people need to be properly housed. We fully recognise that we cannot act like the British and hold our people’s need to housing as a ransom in return for supporting our particular point of view. As republicans we recognise that we have no choice but to support our people in their social needs but we do have a choice as to how and why we do so. We do not have to capitulate in order to support our people’s needs. We do not have to recognise the legitimacy of any governmental authority from whom we demand proper housing. We do not need a rating in an opinion poll to be legitimate ourselves. And we say this very clearly to the people of North Belfast our right to proper housing is a right we must take and not a favour we must barter for. The 32 County Sovereignty Movement will stand four square behind the people of North Belfast, and elsewhere, in their struggle for basic human rights. We will sit on these platforms, we will march on the streets, we will seek unity of consensus to maximise the political strength of our protests. But we will act in the capacity as has been defined here today. 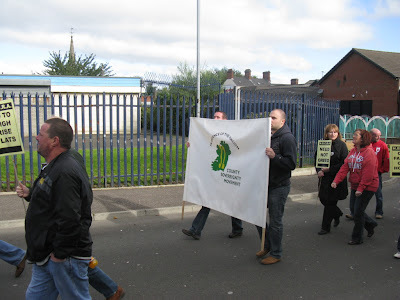 We are Irish republicans. We seek an end to British Parliamentary Activity in our country. Housing Discrimination is part of that Parliamentary activity as is the denial of collective Civil Rights. This problem cannot be reformed, it can only be removed. Beir Bua.